This issue of the Child and Adolescent Psychiatric Clinics of North America, guest edited by Drs. Adele Martel and Catherine Fuchs, aims to bridge the current state of knowledge about risk and resilience during the transition to adolescence for young people with mental illness with the need for developmentally-attuned and culturally–competent strategies to engage and maintain them in treatment. 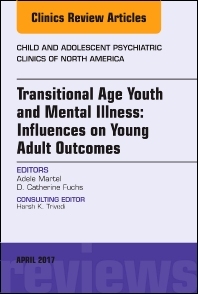 Topics covered in this volume include, but are not limited to: Developmental Psychopathology and Resilience; Conceptualization of Mental Illness in Transitional Age Youth; Suicidal Behaviors and Suicide; Substance Abuse; Working with Parents/Family; Social Media; Youth Transitioning from Foster Care; Heading to College with a Psychiatric Diagnosis; Issues of Diversity, Integrated Identities and Mental Health in Transitional Age Youth; and Autism Spectrum Disorders, among others.